If you have been searching for a OTC hair removal system, for home use, you may have came across the Me my ELOS Tanda system (white base). In the last few months several models of ELOS home systems have been released. In this post we will review the Tanda model, which is the second generation model of the Me. Newer models have been released, you may want to get the Me my ELOS Pro Ultra, or the Me my ELOS Touch. Both of them are third generation models (!) they have similar features. You can identify them by the black octagon base unit design. The Pro Ultra & Me Touch have an extended capacity IPL lamp with over 150,000 flashes installed. Both Me Touch & Me Pro Ultra have 3 ELOS levels while the Tanda has 5 energy levels. This makes sessions with less trouble about energy settings. The first ELOS systems released at 2013 have been a significant breakthrough for home hair removal users. The ELOS technology which until then was used only at professional clinics, arrived for the first time in a compact home device. ELOS is a combination of two technologies, Light + Radio Frequency. The ELOS works by pulsing IPL flashes at the skin. These flashes are attracted to the dark pigment in the hair, and a mild heat is created. The Bi Polar bars at the side of the IPL window, send constant RF (Radio Frequency) wave between one another. The RF reaches the heated hair and raises the temperature until the hair is disabled. The ELOS is safe for all skin colors, including even dark black skin! FDA approved and CE approved, (CE is the European FDA). The treatment is very fast! The Me applicator only needs to glide over the skin, and the IPL Flashes and RF do their process. A full body can be treated in 30 minutes, while other systems require 1 hour per leg (home lasers). The RF does not create heat in the skin, so the Me my ELOS is less painful. Quartz IPL replacement lamps with over 100,000 pulses per cartridge. The ELOS will not emit the flash unless the two Bi-Polar bars are both touching the skin. This prevents accidental flashing of IPL toward the eyes. If you have done your homework, you probably know by now that before each IPL treatment you MUST shave the hair. The designers of the Me my ELOS Tanda have thought of this issue too. The device has several attachments (bought separately) which makes it the most comfortable device for home use. The Me Shaver and Me Epilator, can be attached and the Me becomes a dual solution machine. No need for razors, water, soap or cream.. Just plug in the Me Shaver, shave the part you are planning to treat, and in a few seconds you are ready. You can find at Amazon a Me my ELOS Touch combo kit, (see image above) which includes ALL the accessories for a 360° full body treatment. The Me my ELOS has the largest IPL window from all the home treatment devices, 6 cm² (0.93 sq. in). 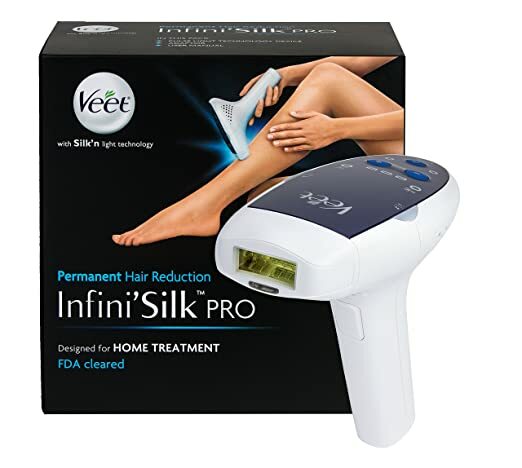 This is double than some of the competing systems, like the Veet InfiniSilk , the Philips Lumea Comfort IPL, Silk’n Flash & Go,and Remington IPL . Wider window means more skin is covered with each pulse of light, and this means faster treatments! The Tanda Me my ELOS is approved for facial use, with the special “Facial Hair Removal Kit”. The kit has an adapter that narrows down the window, so when you want to do a facial hair treatment where precision is important you have a smaller window on demand. The Facial kit comes with safety goggles which also save you money. Many of those buying a home hair removal device add to their Amazon cart a pair of protection eyewear anyway. The Me Tanda is the second generation ELOS system, the Me Touch is the NEWER third generation system. The main difference is that the Tanda has 5 energy settings and the Touch has 3 energy settings. The Touch comes with a larger IPL capacity cartridge than the Tanda. The Me ELOS Tanda (white base) is a wonderful value for money, an upgraded technology in a lower cost unit. You can get Me my ELOS Tanda with Free Shipping from Amazon. Or you can chose the top notch device with all the accessories included, check here to find at Amazon the Me my ELOS Touch combo kit. (Black octagon base). This entry was posted in IPL Hair Removal, Laser Hair Removal News, Safe Removal Systems and tagged Elos hair removal, laser hair removal safety, Me my Elos Hair Reduction, Me my Elos user review, Tanda, Tanda ELOS by admin. Bookmark the permalink.